Coonabarabran is 508 km north west of Sydney by rail and conveniently located on the Newell Highway near the junctions of the Oxley Highway and Warrumbungles Way. 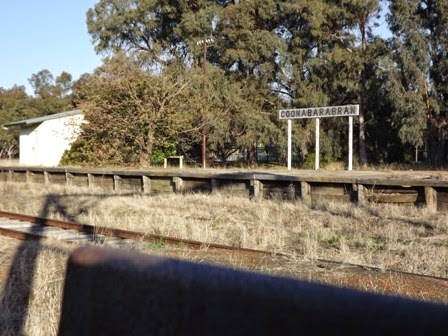 Despite Coonabarabran being the closest town to the Sidings Springs Observatory, trains have not passed through this town since the line north of Binnaway to Gwabegar closed in October 2005. 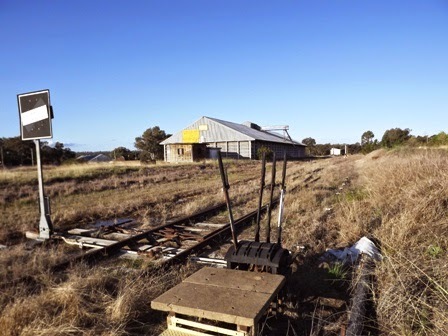 But the track is still in place and the grain shed (above) still standing in Coonabarabran despite the railway station building burning down in 2001. All that remained of Coonabarabran Railway Station by 2011 was this sign on the platform and an out-of shed. 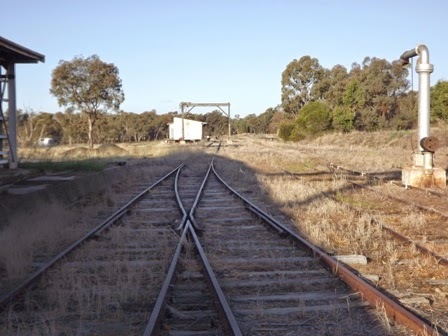 The former line to Gwabegar left the New South Wales Railways' Main Western line at Wallerawang west of Lithgow and wound its ways through Kandos, Mudgee and Gulgong before reaching Coonabarabran Railway Station in 1917. My 1972 Country NSW passenger timetable shows a down mixed mail train stopping at Coonabarabran on Mondays, Wednesdays and Fridays on its way to Gwabegar at 11.56 am, returning as an up service to Sydney on Tuesdays, Wednesdays and Saturdays at 4.20 pm. 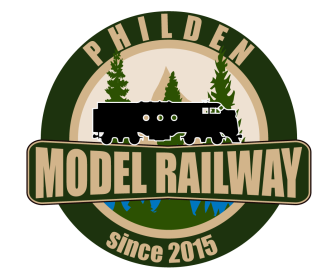 By 1980 however, this service was replaced by a connecting road coach to Mudgee where a mail train ran through to Sydney's Central Station. 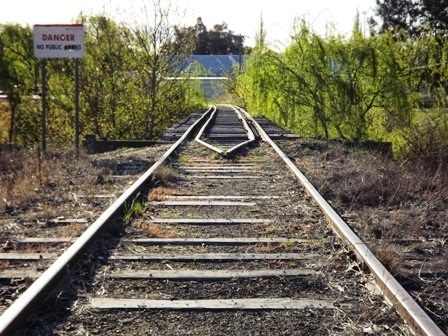 Coonabarabran Railway Yard in 2011. The water tower stands out of picture to the right. It seems that beyond Mudgee, the Gwabegar Branchline was a freight only line from the early 1980's, with Gwabegar and Coonabarabran being used for seasonal wheat traffic until the line's closure in 2005. 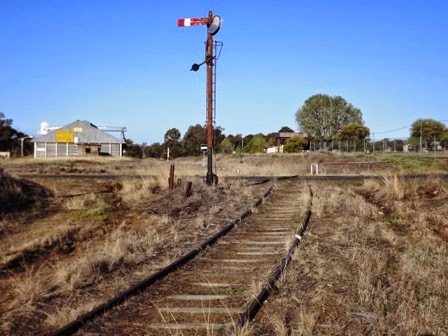 Looking towards Coonabarabran Railway Station from the Cowper Street crossing and still standing home signal, 2011. Arriving at Coonabarabran on a trip north along the Newell Highway from Melbourne to Brisbane in 2011, I pulled the car into Essex Street and stopped beside Neilson Park on the banks of the Castlereagh River. From here it is just a short walk to the main street of town, and while my wife and kids went off to order pizzas from the local pizza place, I had around 15 minutes to follow the railway tracks the short distance from the Castlereagh River Railway Bridge across the Cowper Street level crossing to photograph what remained of Coonabarabran's railway yard. The Castlereagh River Railway Bridge passes by Neilson Park on the down side of Coonabarabran Railway Station, 2011. While the Newell Highway crosses no less than 13 active or former NSW railway lines, knowing where and what time to stop off at some of these unique Australian fringe outback towns to photograph trains is a bit like playing Russian Roulette. While trains no longer call at Coonabarabran today, it is still worth stopping to take a look at a line that is still in tact, slumbering in the foothills of the Warrumbungle National Park. My advice however, is to steer clear of ordering a couple of pizzas to enjoy in the park. When my wife told me how much she paid for two pizzas from a nationally recognised franchise chain, I nearly died. Instead of the $5.95 we were used to back in Brisbane, she had to hand over more than $35 for the same menu item. Coonabarabran might be famous for being the "Astronomy Capital of Australia", but if you ask me, it also can lay claim to having the most expensive pizzas in the country too!